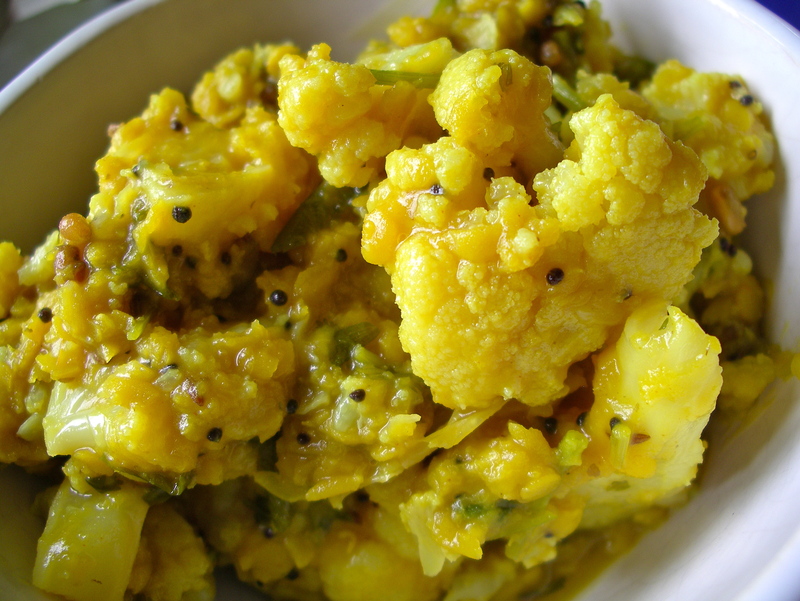 This is a delicious way of cooking cauliflower in a sauce of spiced lentils known as dal or dhal in Southern Asia. The combination is subtle, savory and wonderful. You can add nuts for protein to make this a complete meal or serve as a side for a meat dish or with any number of vegetable dishes for a vegetarian feast. Wash the lentils then put into a roomy pan with the rest of the ingredients. Cook for 30minutes or until the lentils are soft. In a small pan or skillet heat the oil then throw in the first 5 spices, when they pop add the garlic and as soon as it starts to brown add the asefetida and pour straight into the lentils and cauliflower, stir and continue to cook until the cauliflower is just tender but still has a fresh tasting bite. Stir in a little more fresh green chilli and ginger, if using, and some fresh coriander leaf if you have any then serve. Serve with rice or chapatis or a lamb biryani , a grilled meat dish such as masala roast chicken, or a hot meaty curry like Beef Roganjosh or with Bombay potatoes or any number of vegetable dishes such as green bean Coconut Fry for a vegetarian feast. Cooks Note Add spices according to your taste, you could add nigella, fennel or cumin seed or indeed all three, use green cardamom instead of black for a more floral taste and use asefetida instead of ginger for a more earthy savory taste and vary the spicing and quantity of chilli depending on what the dish will be served with. Laura's recipes, finding global inspiration to cook and preserve food from the kitchen garden. All images and text are property of the author, Laura Hudson. If you would like to use something, then please, ask first!